In 2010 Mountain Biking Otago (MBO) started construction of the Big Easy track, part of the Signal Hill MTB network and Three Peaks Trail. 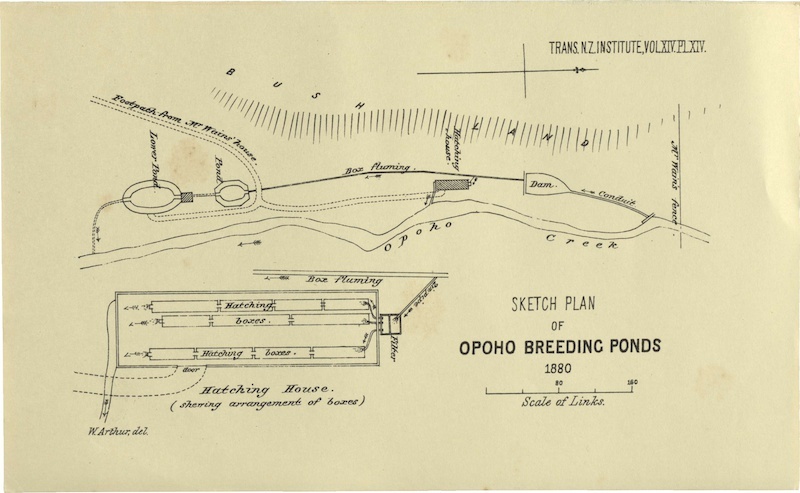 While building the track, the historic Opoho fish ponds were re-discovered. In association with the NZ Historic Places Trust and Fish and Game Otago, MBO has helped restore and safeguard this important part of NZ’s fishy history. \r\nDid you know the suburb of Opoho takes its name from this small stream, Opoho Creek (it is also known as Stony Creek)? The stream flows past Logan Park High School, but is diverted through culverts and then flows into the Water of Leith close to its outflow into the Otago Harbour. \r\nLike many of the small harbor streams, Opoho Creek is home to reclusive native fish, the Banded Kokopu (Galaxias fasciatus Gray, 1842). This member of the Galaxiidae family and its one of the five species that provide us with whitebait. The young are very good climbers and will often escape from buckets by clinging to and wriggling up the sides. Banded Kokopu commonly grow to over 20 cm. They feed on stream and terrestrial insects for their food, often by detecting the small ripples made by moths and flies that become stuck on the water surface of the pool.